The symphony begins with a long orchestral episode where human strengths progressively fatigue opening the way to a sorrowful introspection. With the entry of the soloist singers begins the stormy period that define the presence of pain and exposes the fearsome limits of the "human condition". The second part, for the chorus and soloists only, uses part of the text of the "Dies Irae" from the requiem mass. This part attempts to depict the arrival at the abysmal bottommost of anguish, that moment when an intense imploration is risen, when nothing is enough, when pain clouds consciousness and longs only to get relief. The third and final part develops a stoic musical atmosphere where Hamlet's question is finally voiced by the soloists. This part attempts to present the musically lugubrious serenity of the consciousness in recognizing the inevitable human ending; ending that with panic is lived by the flesh. As we musically get closer to the human collapsing point, rest is blissfully presented. The symphony concludes with a heroic and hopeful chorale declaring the end of the battle, the arrival of rest and the Perpetual Light’s eternal shelter of love. premiere: Sinfonía No.1 has not yet had a public premiere. Las Puertas de Cuerno y Marfil (The Gates of Horn and Ivory) is a symphonic poem based on the homonymous poetic image used by Homer in the nineteenth book of the Odyssey to differentiate the deceitful dreams from the real dreams. Real dreams are those who enter through the gate made of horn and deceitful dreams are those who enter through the gate made of ivory. Given the mystical and prophetic quality of dreams in Homer’s narrative (later used by multiple authors), this symphonic poem intends to build several contrasting sound worlds interacting with each other in the realm of dreams for the purpose of shaping, deceiving or auguring Fate. Despite the particular qualities of each sound worlds and musical motifs of the piece, the development and interaction of these, makes the interpretation of its origin progressively more obscure. The Gates of Horn and Ivory is a work that, immersing the listener into the realm of dreams, challenges his personal interpretation of reality against deception and how these elements determine Fate. Dares the listener to discern which dreams come through the Ivory door and which dreams come through the Horn door, and how these contours the present. Click here to listen the U.S. Premiere of Luminis by the Columbus Symphony Orchestra (October 29, 2015). As the two elements of light and darkness are opposite in that one is the absence of the other, the effect of no change on the original motifs despite the constant change of the musical variations might suggest that, although opposite in nature, they conceive their existence within the same vertex. From a nationwide call for scores, Iván Enrique Rodriguez and his orchestral work Luminis was selected to participate in the EarShot program as part of the Columbus Symphony Orchestra’s Happy Hour Concert series in October 2015. Fortuna Victrix: a Tale of War and Triumph is an episodic tone poem that tries to describe the war of the soul against its greatest fears and frustrations. Fortuna Victrix is the materialization of the goddess Fortuna who brings and represents vicory in wars and conflicts. This symphonic poem begins marked Abstruce Times of Darkenss attempting to describe the soul mired in its deepest frustration and hunted by fears. The soul surrounded by the darkness of its fears, decides to confront them in battle. The battle, marked Times of Misfortune, Doom and Demise, has the soul crushed and almost ready to give up (marked The Summoning), but conjures Fortuna Victrix to bring victory to the horrible battle. The sections marked The Advent, With Immense Majesty, and Victorious represent the arrival of the goddess, her command and victory against the darkness. The final section, Ataraxia, finds the soul in a state of peace and victorious in battle against its fears and frustrations. This work attempts to represent through the goddess Fortuna Victrix the passions and dream that any being can possess in his soul, and that only they can fight and overcome any fear and frustration. premiere: Fortuna Victrix: a Tale of War and Triumph has not yet had a public premiere. Himno de Vida (Life's Hymn) is an orchestral overture composed for trumpeter, producer and arranger Luis “Perico” Ortiz for inclusion on the recording Tiempo de Amar. The album was produced specifically for the support of the San Jorge Children’s Foundation. premiere: Himno de Vida was premiered and recorded in 2013 by the Ernesto Ramos Antonini Symphony Orchestra with Iván Enrique Rodriguez as conductor in the Jesús María Sanromá Symphony Hall at the Conservatorio de Música de Puerto Rico. 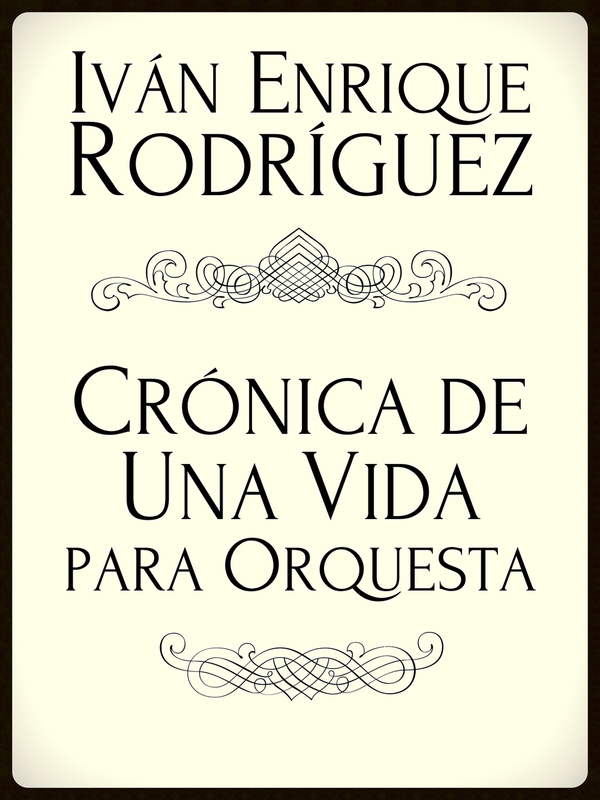 Crónica de Una Vida (A Life’s Chronicle) is an orchestral overture that is structured as absolute music in Sonata form, yet has programmatic intention and an aura of Life itself writing a letter about the process of living. The overture travels through different landscapes of Life recalling its journey from the genesis of its existence to the acceptance of death as the achievement of life’s cycle and spiritual plenitude. premiere: Crónica de Una Vida was premiered and recorded in 2013 by Ernesto Ramos Antonini Symphony Orchestra with Iván Enrique Rodriguez as conductor in the Puerto Rico Capitol House.